t had been a few years since the club had been to Knoydart, the last time staying at Barrisdale when we had enjoyed a spell of glorious weather, could we be lucky again at Inverie this time round………. We made our way across to Inverie on the boat from Mallaig throughout the day on Friday, in Chris Ro`s case there was a nervous wait at the pier as he somehow had managed to make a booking for the wrong boat for the wrong day, not his fault he assured me! Mike and Fiona had booked on the right boat at the right time and were first onto Knoydart that morning and had cycled round to the west and gone up Ladhar Bheinn and the top of Stob Coire Odhar. The other Chris R had also arrived earlier and headed up the Corbett behind Inverie, Stob Coire Coinneachean. A night of chat, Mike & Fiona`s home brewed gin (very pleasant) and some whisky in front of the roaring stove rounded off our first night on Knoydart. The next morning the weather looked settled and the tops clear and some big days were afoot. Allan S and Kate headed west round to Beinn na Callich, a hill which remarkably had evaded a successful summit bid by Allan S previously, they set off to put this right. Also heading round to the west was Alan H, Fiona C and Kenny for an ascent of Ladhar Bheinn while Matt and Sinead got caught up in deer fences on Beinn Buidhe so changed plans and headed up Stob Coire Coinneachean. The rest of us, and a big merry gang it was, myself, Anne, Elsie, Mike, Fiona, Alison, David, Shireen, both Chris R`s, Keith and Emma took in Meall Buidhe and Luinne Bheinn. Susan got as far as Meall Buidhe but with only kahtoolas wisely decided to head down and not carry on to Luinne Bheinn, the snow was very solid and great for walking but crampons were an absolute must and it was a lovely walk along the ridge between the two munros with great views west to Eigg and Rum and north to Torridon. 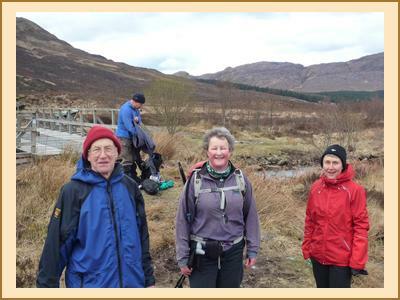 It was a weary group who trudged back along the track from Mam Barrisdale where we picked up Kenny and later Fiona C who having seen the east ridge on Ladhar Bheinn decided a traverse just had to be done, it was fair to say they were also both feeling weary too. A great day out for everybody. More chat and drink in front of the stove (although sadly the gin had disappeared) finished a fine day. Sunday was even better than the day before, a frost, clear blue skies and little wind, perfect. Matt and Sinead headed back for Beinn Buidhe avoiding the deer fences, Chris Re, Mike and Fiona and Susan were also on Beinn Buidhe, myself and Elsie went round to Ladhar Bheinn from the west and I carried on to Stob Coire Coinneachean where I saw Alan H and Allan S in the distance and caught up with Shireen and Kate descending its fantastic west ridge. Kenny, Alison and Anne also went west and on to the Hugh which sits between Inverie and Doune while Keith, Emma, David and Chris Ro did a traverse of Ladhar Bheinn, reversing the route taken by Kenny and Fiona the day before. 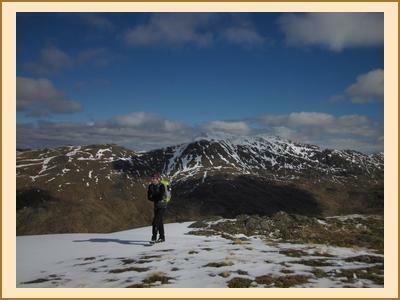 It had been a glorious day, I even managed to sit at the summit of Ladhar Bheinn in my shorts, spring in the air? A few of us headed to the old forge for dinner that evening which was very nice, although very quiet. As we huddled on the boat in the biting cold wind on the way back to Mallaig on Monday and looked back at Knoydart we all reflected on a great weekend and picked out all the hills we had covered over the last few days and yep it had been on a par with last club trip to Knoydart.